The two most aggressive military forces in the world have added a new frontier in their immense ability to deal death and destruction. In the same week, an Israeli firm launched the first-ever torpedo from an unmanned sea vessel while a U.S. artificially intelligent fighter pilot easily won combat simulations against human pilots. These achievements are a testament to the sad reality that military interests are often the first to take advantage of wondrous advancements such as AI, just as nuclear physics and other technologies were hijacked for more efficient methods of killing. Stephen Hawking pointed this out during an interview on the Larry King show. Governments seem to be engaged in an AI arms race, designing planes and weapons with intelligent technologies. The funding for projects directly beneficial to the human race, such as improved medical screening seems a somewhat lower priority. The AI fighter jet pilot, known as Alpha, was developed by researchers from the University of Cincinnati and defense company Psibernetix. It used four virtual jets to defend a coastline from two attacking planes with superior weapons systems—without suffering any losses. Retired US Air Force colonel Gene Lee was shot out of the air every time after protracted engagements, and could not even manage to score a hit on Alpha. The groundbreaking feat was accomplished through the use of “fuzzy logic” to efficiently compute the massive amounts of data from a simulated fighter jet. Instead of analyzing every bit of data equally, fuzzy logic assigns a degree of truth or significance to the pieces of data before making a broader decision. “Here, you’ve got an AI system that seems to be able to deal with the air-to-air environment, which is extraordinarily dynamic, has an extraordinary number of parameters and, in the paper, more than holds its own against a skilled and capable, experienced combat pilot,” said Doug Barrie, a military aerospace analyst at think tank IISS. 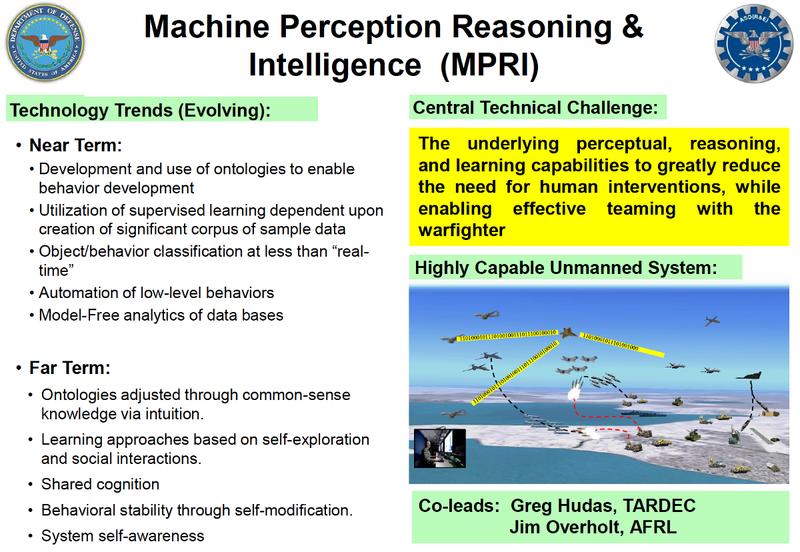 For now, the talk is about using Alpha “as a simulation tool or as a device to help develop better systems for assisting human pilots in the air.” But it’s a safe assumption that using AI to pilot real machines is being explored by a military machine incessantly hungry for the next best means of reaping death and destruction. If an AI fighter pilot were ever to fly an actual fighter jet, the obvious question is, what happens when it decides to attack a non-military target? Of course, human pilots routinely bomb innocent civilians, but this is “justified” as collateral damage in the pursuit of defeating the bogeyman du jour. The unmanned torpedo-launching sea vessel system, called Seagull, will soon be put into use by the Israeli Navy for use against submarines and sea mines. It consists of one or two surface vessels, each about 40 feet long, operated remotely from manned ships or the shore. One vessel carries a sonar system that can search the entire water volume, with another that deploys an underwater robot for further investigation. When a threat is confirmed, a vessel launches a torpedo-like weapon to destroy the target. This test carried out in the Haifa port marks the first time that a torpedo has been launched from an unmanned boat. ‘The success of the first torpedo launch test is a major milestone, confirming the Unmanned Surface Vessel’s capability to incorporate weapons that counter submarines, in addition to its unique submarine and mine detection capabilities,’ Elbit, the firm behind the trial said. While it’s great to “take the man out of the minefield,” the Seagull also represents the kind of military advancement we see with unmanned aerial vehicles, or drones. As we know, drones have been the tool of choice for expanding undeclared war into countries in the name of fighting terrorism, which has resulted in thousands of innocent civilians being killed. When bombing is carried out remotely, from the comfort of a padded seat in a secure building, the operator is that much more detached from the reality of killing people. Of course, operating torpedo-equipped sea vessels is a different beast, but the trend toward unmanned killing machines is nonetheless troubling. With AI being brought into military technology, how long before scenes from the Terminator movies are a real thing? What Could Go Wrong? US Unveils Artificially Intelligent Fighter Pilot. 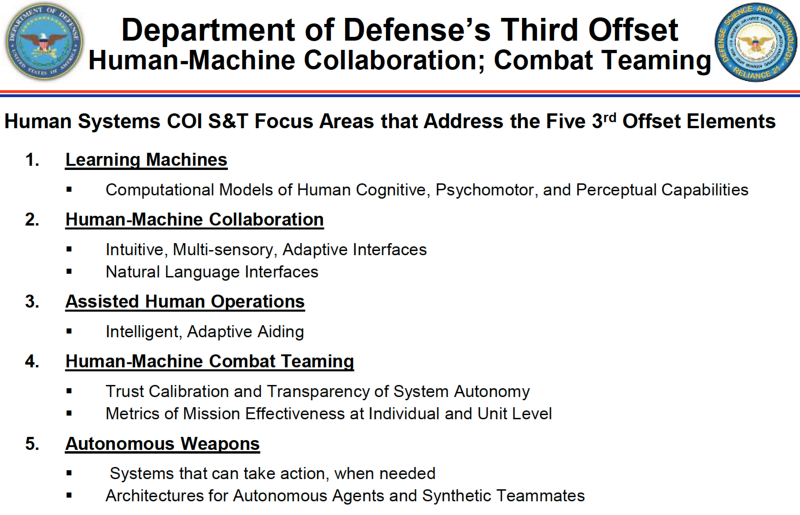 An unclassified 2016 Department of Defense (DoD) document, the Human Systems Roadmap Review, reveals that the US military plans to create artificially intelligent (AI) autonomous weapon systems, which will use predictive social media analytics to make decisions on lethal force with minimal human involvement. 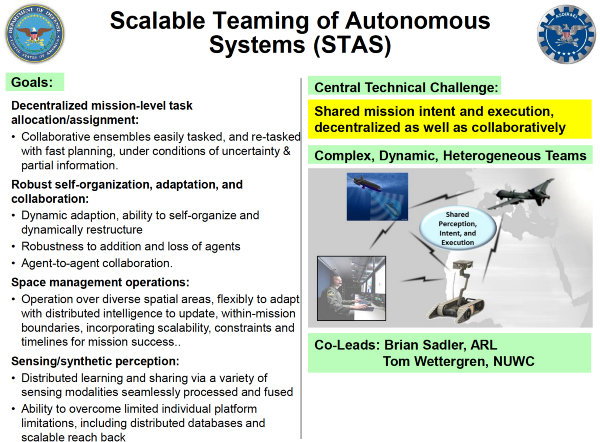 Despite official insistence that humans will retain a “meaningful” degree of control over autonomous weapon systems, this and other Pentagon documents dated from 2015 to 2016 confirm that US military planners are already developing technologies designed to enable swarms of “self-aware” interconnected robots to design and execute kill operations against robot-selected targets. 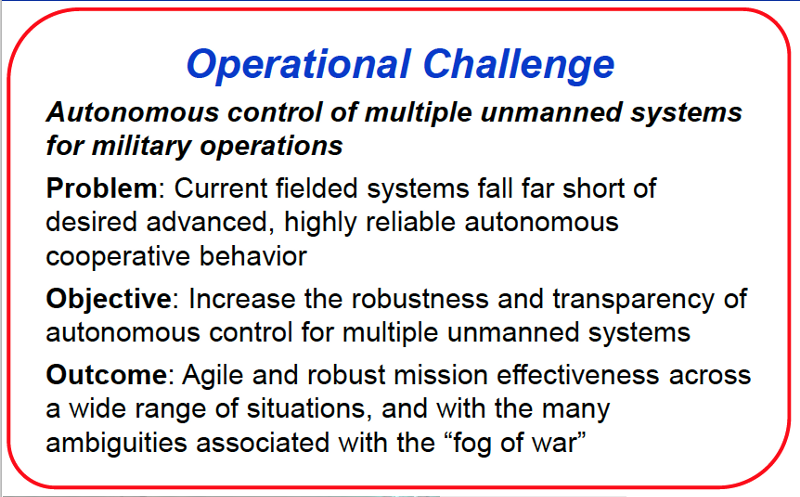 More alarmingly, the documents show that the DoD believes that within just fifteen years, it will be feasible for mission planning, target selection and the deployment of lethal force to be delegated entirely to autonomous weapon systems in air, land and sea. The Pentagon expects AI threat assessments for these autonomous operations to be derived from massive data sets including blogs, websites, and multimedia posts on social media platforms like Twitter, Facebook and Instagram. The raft of Pentagon documentation flatly contradicts Deputy Defense Secretary Robert Work’s denial that the DoD is planning to develop killer robots. 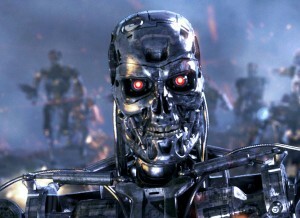 Efforts to create autonomous robot killers have evolved over the last decade, but have come to a head this year. 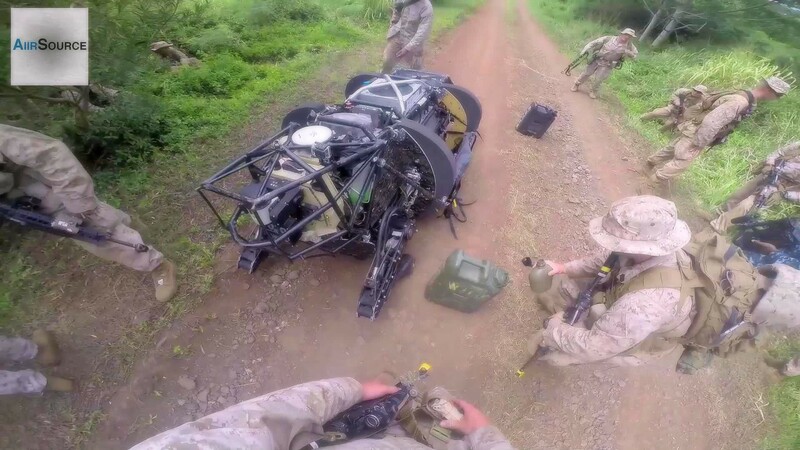 A National Defense Industry Association (NDIA) conference on Ground Robotics Capabilities in March hosted government officials and industry leaders confirming that the Pentagon was developing robot teams that would be able to use lethal force without direction from human operators. In April, government representatives and international NGOs convened at the United Nations in Geneva to discuss the legal and ethical issues surrounding lethal autonomous weapon systems (LAWS). That month, the UK government launched a parliamentary inquiry into robotics and AI. And earlier in May, the White House Office of Science and Technology announced a series of public workshops on the wide-ranging social and economic implications of AI. Most media outlets have reported the fact that so far, governments have not ruled out the long-term possibility that intelligent robots could be eventually authorized to make decisions to kill human targets autonomously. But contrary to Robert Work’s claim, active research and development efforts to explore this possibility are already underway. The plans can be gleaned from several unclassified Pentagon documents in the public record that have gone unnoticed, until now. Among them is a document released in February 2016 from the Pentagon’s Human Systems Community of Interest (HSCOI). The document shows not only that the Pentagon is actively creating lethal autonomous weapon systems, but that a crucial component of the decision-making process for such robotic systems will include complex Big Data models, one of whose inputs will be public social media posts. The HSCOI is a little-known multi-agency research and development network seeded by the Office of the Secretary of Defense (OSD), which acts as a central hub for a huge plethora of science and technology work across US military and intelligence agencies. The document is a 53-page presentation prepared by HSCOI chair, Dr. John Tangney, who is Director of the Office of Naval Research’s Human and Bioengineered Systems Division. 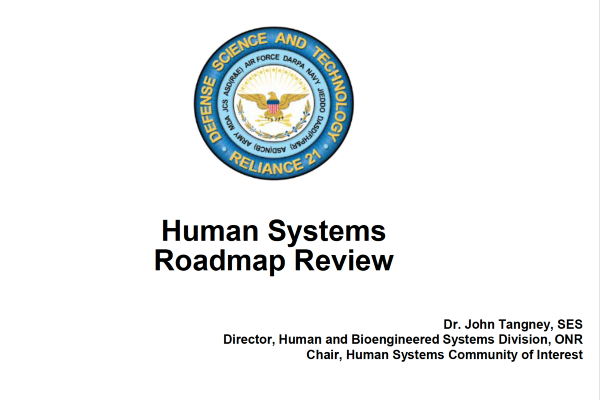 Titled Human Systems Roadmap Review, the slides were presented at the NDIA’s Human Systems Conference in February. The document explicitly asserts that these new autonomous weapon systems should be able to respond to threats without human involvement, but in a way that simulates human behavior and cognition. The HSCOI consists of senior officials from the US Army, Navy, Marine Corps, Air Force, Defense Advanced Research Projects Agency (DARPA); and is overseen by the Assistant Secretary of Defense for Research & Engineering and the Assistant Secretary of Defense for Health Affairs. HSCOI’s work goes well beyond simply creating autonomous weapons systems. An integral part of this is simultaneously advancing human-machine interfaces and predictive analytics. 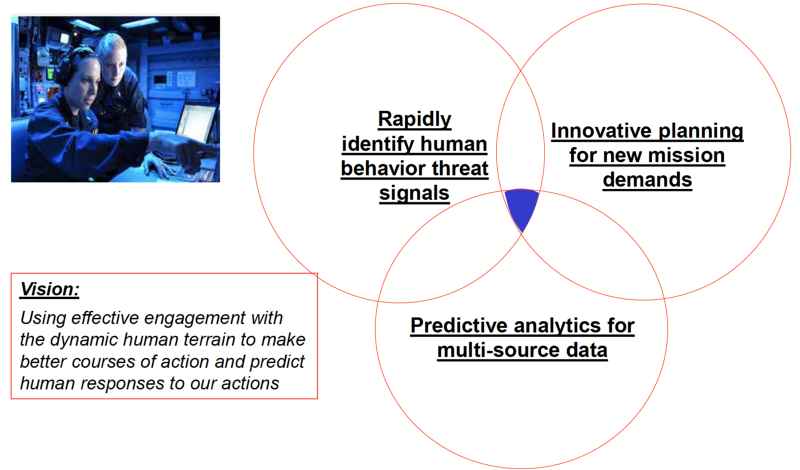 This is short-hand for intelligence, surveillance and reconnaissance of a population in an ‘area of interest’, by collecting and analyzing data on the behaviors, culture, social structure, networks, relationships, motivation, intent, vulnerabilities, and capabilities of a human group. 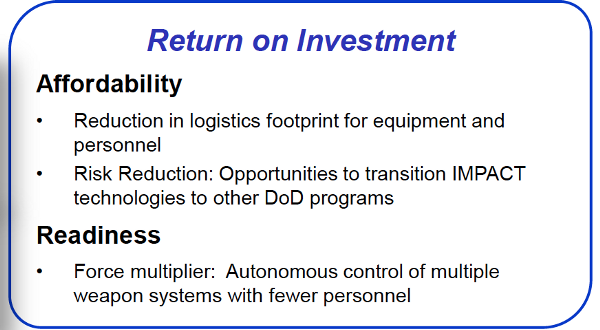 The Human Systems Roadmap Review document from February 2016 shows that this area of development is a legacy of the Pentagon’s controversial “human terrain” program. The Human Terrain System (HTS) was a US Army Training and Doctrine Command (TRADOC) program established in 2006, which embedded social scientists in the field to augment counterinsurgency operations in theaters like Iraq and Afghanistan. The idea was to use social scientists and cultural anthropologists to provide the US military actionable insight into local populations to facilitate operations — in other words, to weaponize social science. The $725 million program was shut down in September 2014 in the wake of growing controversy over its sheer incompetence. The HSCOI program that replaces it includes social sciences but the greater emphasis is now on combining them with predictive computational models based on Big Data. The brochure puts the projected budget for the new human systems project at $450 million. 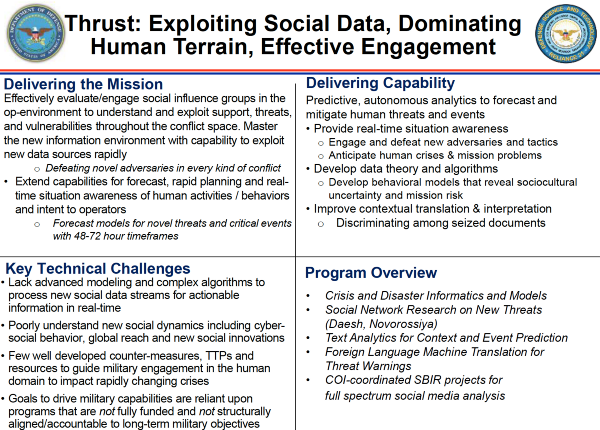 The Pentagon’s Human Systems Roadmap Review demonstrates that far from being eliminated, the HTS paradigm has been upgraded as part of a wider multi-agency program that involves integrating Big Data analytics with human-machine interfaces, and ultimately autonomous weapon systems. 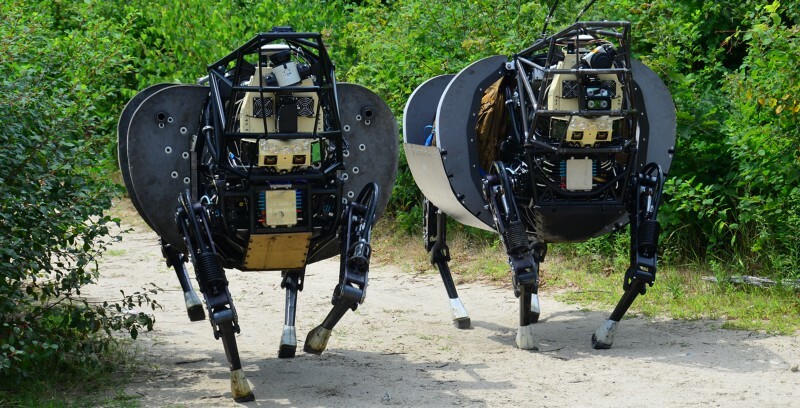 Are those ‘soldiers’ in the photo human… or are they really humanoid (killer) robots? The document refers to the use of social media data to forecast future threats and, on this basis, automatically develop recommendations for a “course of action” (CoA). In other words, the human input into the development of course of action “selection/analysis” must be increasingly reduced, and replaced with automated predictive analytical models that draw extensively on social media data. Both the US and British governments are therefore rapidly attempting to redefine “human control” and “human intent” in the context of autonomous systems. Among the problems that emerged at the UN meetings in April is the tendency to dilute the parameters that would allow describing an autonomous weapon system as being tied to “meaningful” human control. Unfortunately, there is a ‘but’. 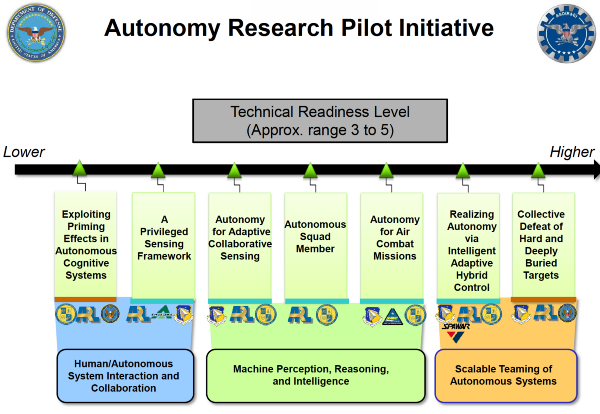 The March document, Autonomous Horizons: System Autonomy in the Air Force, was authored by Dr. Greg Zacharias, Chief Scientist of the US Air Force. The IEEE conference where it was presented was sponsored by two leading government defense contractors, Lockheed Martin and United Technologies Corporation, among other patrons. The analyst’s role here is simply to authorize the kill, but in reality the essential importance of human control — assessment of the integrity of the kill decision — has been relegated to the end of an entirely automated analytical process, as a mere perfunctionary obligation. 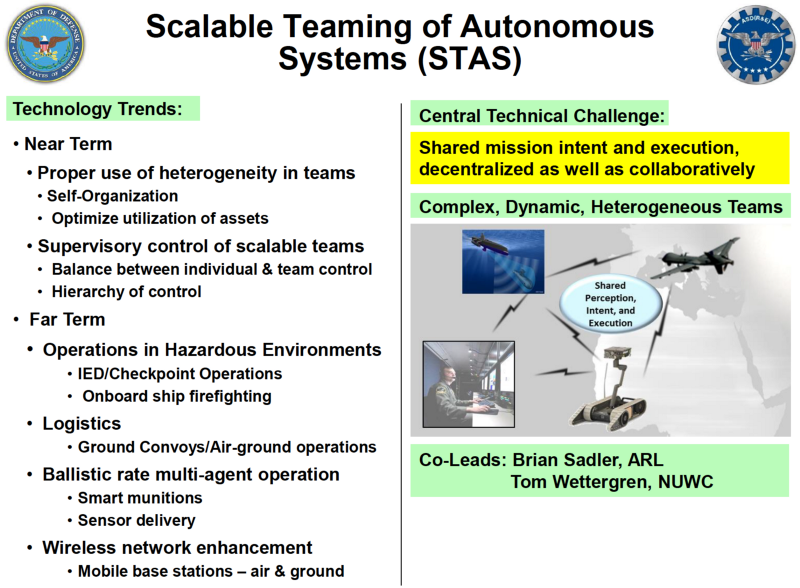 The goal, in other words, is a single integrated lethal autonomous weapon system combining full spectrum analysis of all data sources with “weapon effects” — that is, target selection and execution. The document goes to pains to layer this vision with a sense of human oversight being ever-present. 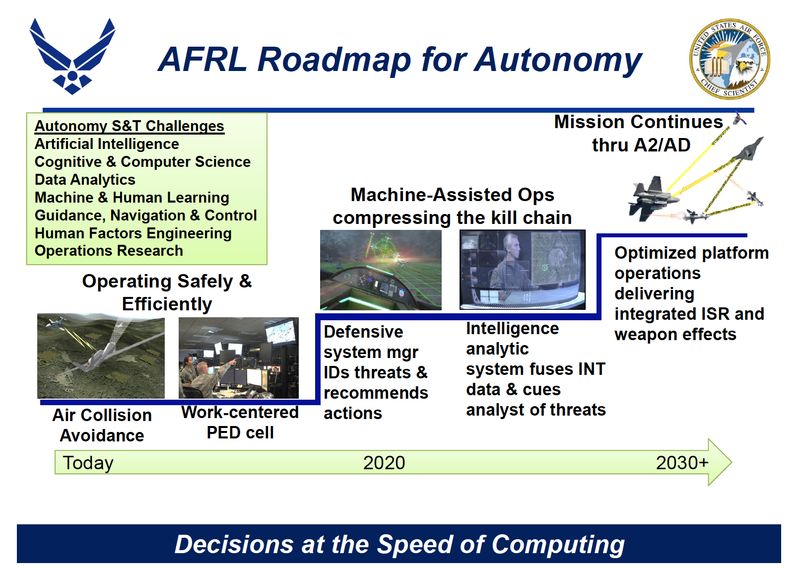 Yet an even more blunt assertion of the Pentagon’s objective is laid out in a third document, a set of slides titled DoD Autonomy Roadmap presented exactly a year earlier at the NDIA’s Defense Tech Expo. •Ontologies adjusted through common-sense knowledge via intuition. •Learning approaches based on self-exploration and social interactions. Once again, this is to facilitate a process by which humans are increasingly removed from the nitty gritty of operations. Notice the lack of human collaboration. The document admits, though, that the Pentagon’s major challenge is to mitigate against unpredictable environments and emergent behavior. TBM refers directly to a battle management autonomy software for unmanned aircraft. Yet the biggest challenge, nowhere acknowledged in any of the documents, is ensuring that automated AI target selection actually selects real threats, rather than generating or pursuing false positives. 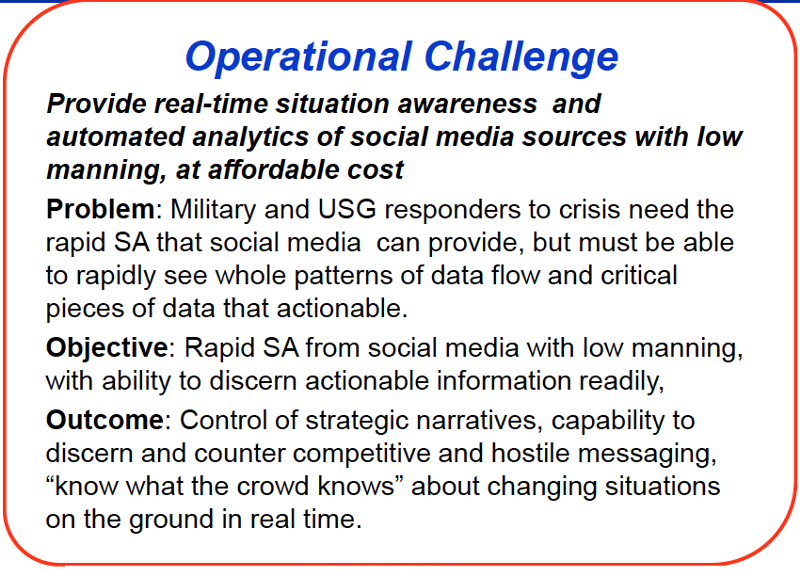 According to the Human Systems roadmap document, the Pentagon has already demonstrated extensive AI analytical capabilities in real-time social media analysis, through a NATO live exercise last year. The primary contributor to the Trident Juncture social media analysis for NATO, which occurred over two weeks from late October to early November 2015, was a team led by information scientist Professor Nitin Agarwal of the University of Arkansas, Little Rock. Agarwal’s project was funded by the US Office of Naval Research, Air Force Research Laboratory and Army Research Office, and conducted in collaboration with NATO’s Allied Joint Force Command and NATO Strategic Communications Center of Excellence. Among the top seven blogs identified as key nodes for anti-NATO internet traffic were websites run by Andreas Speck, an antiwar activist; War Resisters International (WRI); and Egyptian democracy campaigner Maikel Nabil Sanad — along with some Spanish language anti-militarism sites. Andreas Speck is a former staffer at WRI, which is an international network of pacifist NGOs with offices and members in the UK, Western Europe and the US. One of its funders is the Joseph Rowntree Charitable Trust. The WRI is fundamentally committed to nonviolence, and campaigns against war and militarism in all forms. Most of the blogs identified by Agarwal’s NATO project are affiliated to the WRI, including for instance nomilservice.com, WRI’s Egyptian affiliate founded by Maikel Nabil, which campaigns against compulsory military service in Egypt. Nabil was nominated for the Nobel Peace Prize and even supported by the White House for his conscientious objection to Egyptian military atrocities. The project was touted by Agarwal as a great success: it managed to extract 635 identity markers through metadata from the blog network, including 65 email addresses, 3 “persons”, and 67 phone numbers. This is the same sort of metadata that is routinely used to help identify human targets for drone strikes — the vast majority of whom are not terrorists, but civilians. Agarwal’s conference slides list three Pentagon-funded tools that his team created for this sort of social media analysis: Blogtracker, Scraawl, and Focal Structures Analysis. Flagging up an Egyptian democracy activist like Maikel Nabil as a hostile entity promoting anti-NATO and anti-US propaganda demonstrates that when such automated AI tools are applied to war theatres in complex environments (think Pakistan, Afghanistan and Yemen), the potential to identify individuals or groups critical of US policy as terrorism threats is all too real. This case demonstrates how deeply flawed the Pentagon’s automation ambitions really are. Even with the final input of independent human expert analysts, entirely peaceful pro-democracy campaigners who oppose war are relegated by NATO to the status of potential national security threats requiring further surveillance. Rather than prohibiting the development of lethal autonomous weapon systems, the directive simply consolidates all such developments under the explicit authorization of the Pentagon’s top technology chiefs. Worse, the directive expires on 21st November 2022 — which is around the time such technology is expected to become operational. Indeed, later that year, Lieutenant Colonel Jeffrey S. Thurnher, a US Army lawyer at the US Naval War College’s International Law Department, published a position paper in the National Defense University publication, Joint Force Quarterly. If these puppies became self-aware, would they be cuter? Lt. Col. Thurnher went on to become a Legal Advisor for NATO Rapid Deployable Corps in Munster, Germany. In this capacity, he was a contributor to a little-known 2014 official policy guidance document for NATO Allied Command Transformation, Autonomy in Defence Systems. The NATO document, which aims to provide expert legal advice to government policymakers, sets out a position in which the deployment of autonomous weapon systems for lethal combat — in particular the delegation of targeting and kill decisions to machine agents — is viewed as being perfectly legitimate in principle. It is the responsibility of specific states, the document concludes, to ensure that autonomous systems operate in compliance with international law in practice — a caveat that also applies for the use of autonomous systems for law-enforcement and self-defence. Acknowledging that currently only humans are able to make a “judgement about the ethical permissibility of foreseen but unintentional harm to civilians (collateral damage)”, the NATO policy document urges states developing autonomous weapon systems to ensure that eventually they “are able to integrate with collateral damage estimation methodologies” so as to delegate targeting and kill decisions accordingly. The NATO position is particularly extraordinary given that international law — such as the Geneva Conventions — defines foreseen deaths of civilians caused by a military action as intentional, precisely because they were foreseen yet actioned anyway. 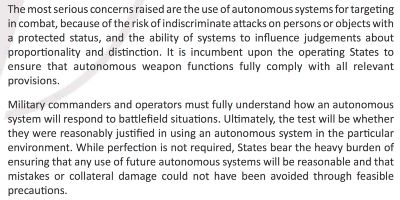 In other words, NATO’s official policy guidance on autonomous weapon systems sanitizes the potential for automated war crimes. 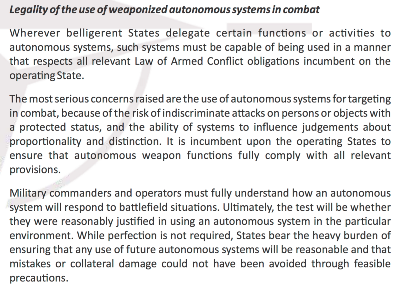 The document actually encourages states to eventually develop autonomous weapons capable of inflicting “foreseen but unintentional” harm to civilians in the name of securing a ‘legitimate’ military advantage. Yet the NATO document does not stop there. It even goes so far as to argue that policymakers considering the development of autonomous weapon systems for lethal combat should reflect on the possibility that delegating target and kill decisions to machine agents would minimize civilian casualties. A new report by Paul Scharre, who led the Pentagon working group that drafted DoD Directive 3000.09 and now heads up the future warfare program at the Center for New American Security in Washington DC, does not mince words about the potentially “catastrophic” risks of relying on autonomous weapon systems. Noting that in the software industry, for every 1,000 lines of code, there are between 15 and 50 errors, Scharre points out that such marginal, routine errors could easily accumulate to create unexpected results that could be missed even by the most stringent testing and validation methods. The documents discussed here show that the Pentagon is going to pains to develop ways to mitigate these risks. As the trajectory toward AI autonomy and complexity accelerates, so does the risk that autonomous weapon systems will, eventually, wreak havoc. Dr Nafeez Ahmed is an investigative journalist, bestselling author and international security scholar. A former Guardian writer, he writes the ‘System Shift’ column for VICE’s Motherboard, and is a weekly columnist for Middle East Eye. This story is being released for free in the public interest, and was enabled by crowdfunding. I’d like to thank my amazing community of patrons for their support, which gave me the opportunity to work on this story. Please support independent, investigative journalism for the global commons via Patreon.com, where you can donate as much or as little as you like. The Pentagon is building a ‘self-aware’ killer robot army fueled by social media — INSURGE intelligence — Medium. Well, you can’t blame them for trying, can you? Earlier today the grandiloquently named “Future of Life Institute” (FLI) announced an open letter on the subject of ‘autonomous weapons.’ In case you’re not keeping up with artificial intelligence research, that means weapons that seek and engage targets all by themselves. 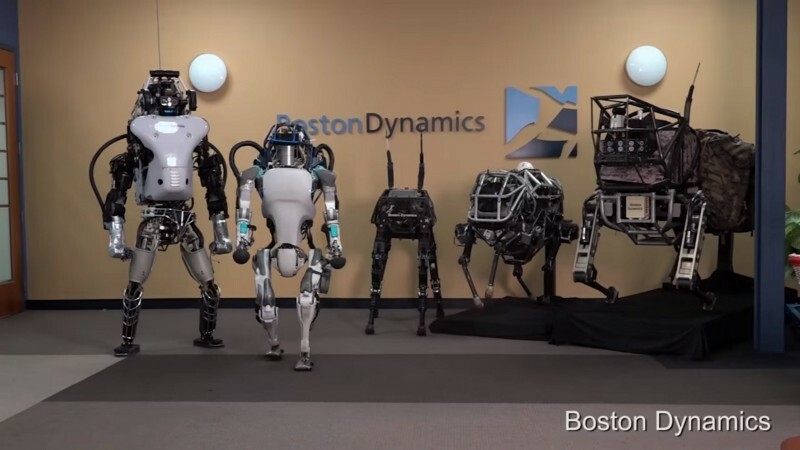 While this sounds fanciful to the uninformed, it is in fact a dystopian nightmare that, thanks to startling innovations in robotics and artificial intelligence by various DARPA-connected research projects, is fast becoming a reality. Heck, people are already customizing their own multirotor drones to fire handguns; just slap some AI on that and call it Skynet. 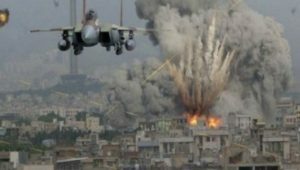 According to FLI, the idea isn’t scary in and of itself, it isn’t scary because of the documented history of the warmongering politicians in the US and the other NATO countries, it isn’t scary because governments murdering their own citizens was the leading cause of unnatural death in the 20th century. No, it’s scary because “It will only be a matter of time until [autonomous weapons] appear on the black market and in the hands of terrorists, dictators wishing to better control their populace, warlords wishing to perpetrate ethnic cleansing, etc.” If you thought the hysteria over Iran’s nuclear non-weapons program was off the charts, you ain’t seen nothing yet. Just wait till the neo-neocons get to claim that Assad or Putin or the enemy of the week is developing autonomous weapons! In fact, the FLI doesn’t want to stop the deployment of AI on the battlefield at all. Quite the contrary. “There are many ways in which AI can make battlefields safer for humans” the letter says before adding that “AI has great potential to benefit humanity in many ways, and that the goal of the field should be to do so.” In fact, they’ve helpfully drafted a list of research priorities for study into the field of AI on the assumption that AI will be woven into the fabric of our society in the near future, from driverless cars and robots in the workforce to, yes, autonomous weapons. So who is FLI and who signed this open letter. Oh, just Stephen Hawking, Elon Musk, Nick Bostrom and a host of Silicon Valley royalty and academic bigwigs. Naturally the letter is being plastered all over the media this week in what seems suspiciously like an advertising campaign for the machine takeover, with Bill Gates and Stephen Hawking and Elon Musk having already broached the subject in the past year, as well as the Channel Four drama Humans and a whole host of other cultural programming coming along to subtly indoctrinate us that this robot-dominated future is an inevitability. This includes extensive coverage of this topic in the MSM, including copious reports in outlets like The Guardian telling us how AI is going to merge with the “Internet of Things.” But don’t worry; it’s mostly harmless. And so we have suspect organizations like the “Future of Life Institute” trying to steer the conversation on AI into how we can safely integrate these potentially killer robots into our future society even as the Hollywood programmers go overboard in steeping us in the idea. Meanwhile, those of us in the reality-based community get to watch this grand uncontrolled experiment with the future of our world unfold like the genetic engineering experiment and the geoengineering experiment. 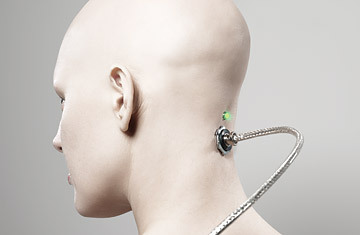 What can be done about this AI / transhumanist / technocratic agenda? Is it possible to be derailed? Contained? Stopped altogether? How? Corbett Report members are invited to log in and leave their thoughts in the comment section below. Source : The Corbett Report. 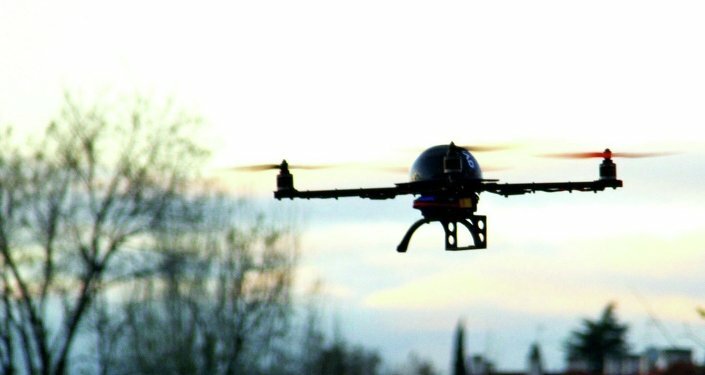 In an innovative attempt to combat crime in the United Kingdom, police are seeking to employ Unmanned Aerial Vehicles (UAVS), or drones, to help them on the beat. It’s a move that, perhaps predictably, makes some Brits uneasy. The Sussex and Surrey police force have been given almost £250,000 by the Home Office to purchase five drones to evaluate how they perform – specifically, the force wants to know whether they can be used to collect aerial evidence (which may be handy in cases of missing persons,) and investigate areas that could be potentially dangerous to the lives of the officers, the UK Times reported.This is not the first time Sussex and Surrey has experimented with drones. Drones near Gatwick Airport in West Sussex proved in some instances to be faster, safer, and cheaper than humans for perimeter patrols. The force now seeks to look into broader uses for the technology, to advise other divisions considering drone use, and to draw up a training scheme that could allow other officers to properly pilot drones. The move comes as regulations for recreational drone use in the UK are tightening. A man in Liverpool was arrested earlier in March for filming Premier League football matches with a drone, and police are investigating an attempt to smuggle contraband into Bedford Prison using a UAV. But as police forces across the country are being pressured to cut costs, UAVs seem a likely route. But, as Engadget reports, until technology has progressed enough for drones to make arrests, they’re not likely to fully replace human forces in the near future. SKELETON CREW: With AI, there will be no need for large, fully staffed police surveillance units. SEE ALSO: NeoFace: How Anonymous Are We To Big Brother Police Agencies? Cameras previously situated out of reach to stop the public from vandalising them does not appear to be an issue anymore. Clearly, police now believe that the public are sufficiently desensitised to CCTV and thus will not physically interfere with the system. Having cameras head height enables facial recognition software to run behind whatever surveillance system is operating, which is precisely what West Midlands Police intend to run behind Birmingham’s HD CCTV network. West Midlands Police have a Public Private Partnership (PPP) with multinational corporation Accenture “to revolutionise and streamline the way the force handles data, uses mobile and digital technology and interacts with social media and other organisations such as local authorities.” This includes running a facial recognition system called ‘Face in the crowd’ behind what the Association of Chief Police Officers (ACPO) call “the wealth of CCTV footage available” in Birmingham. Apparently ’Face in the Crowd’ is sold to us as a device purely for finding missing persons, much like how ‘Suspect Search’ in Glasgow is primarily for missing children vulnerable adults. All for our safety of course. How long before West Midlands Police start utilising a wider variety of Accenture’s products such as facial recognition body worn cameras? Would they tell the public if they did anyway? Maybe they would follow ACPO’s lead of using a facial recognition system since April 2014, accessing the Police National Database using 18 million of our photographs, a system that they have been developing since October 2012, and failing to inform anyone. Quite where West Midlands Police are up to with their facial recognition technology is unclear, however a Freedom of Information request to the police authority is due back from them by end March 2015, at which time we can analyze their official policy on the technology. With an ever-increasing use of these technological and analytical ‘intelligences’ being used behind what is unchanged existing street furniture, essentially nothing outwardly changes for us. These systems are becoming more the norm, and why not, if it is “for the greater good”, as the police agencies state? However each day they are used, they ‘learn’ more about how we behave; our mass movements as herds in cities and as individual humans. How long will it be before the systems begin predicting ‘pre-crime’ in each one of us individually? Currently, precrime software solutions are running in selected police departments across Great Britain, as well as in other countries. Where does the analytics stop? Will the machine scan parliament’s reams of legislation to analyse the particular crime that has been committed by an individual? Then perhaps the machine can scan court case histories, to generate algorithms for ‘best conviction outcomes’, or advising police agencies specifically what crime has been committed and the optimum penalty. Could the machine ultimately analyse whether we are guilty, or innocent? Beyond its obvious astonishing computing ability and task applications, the real prospect of AI raises so many more questions regarding the devolution of many layers of human decision-making, that until now have been taken completely for granted. As AI increases in its its power, so too will the ethical considerations grow. One would hope so anyway. 21WIRE featured author Pippa King is a researcher and writer whose work focuses on digital privacy and the emerging issues regarding RFID, biometrics and surveillance. See more of Pippa’s work and research at State of Surveillance and Biometrics in Schools. On January 4, 2015, the Daily Beast revealed an undated internal memo to Air Force Chief of Staff General Mark Welsh from General Herbert “Hawk” Carlisle stating that pilot “outflow increases will damage the readiness and combat capability of the MQ-1/9 [Predator and Reaper] enterprise for years to come” and added that he was “extremely concerned.” Eleven days later, the issue got top billing at a special high-level briefing on the state of the Air Force. Secretary of the Air Force Deborah Lee James joined Welsh to address the matter. “This is a force that is under significant stress—significant stress from what is an unrelenting pace of operations,” shetold the media. Control through electronic surveillance is totally pervasive now… But can technology produce a strong revolution of freedom, independence and self sufficiency as well? I’m hopeful, but not convinced. After reading up on the history of cybernetics, the ARPA (DARPA) Internet and television, I’m about ready to go Amish, or low-tech Amish. 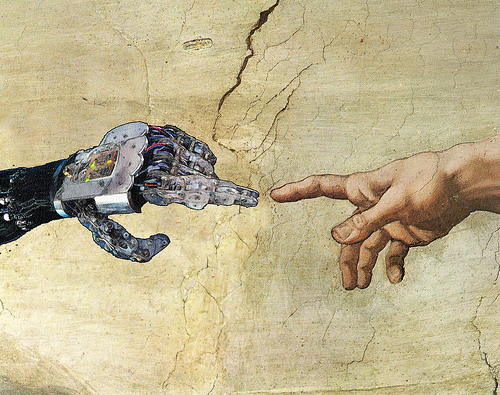 The Technological Age & The End of Freedom? The topic of the Unabomber came up again. It concerns a favorite passage of transhumanist Ray Kurzweil (included in his book Age of Spiritual Machines) and Bill Joy (which he wrote about), founder of the now acquired and defunct Sun Microsystems, in which Ted Kaczynski explains the “New Luddite Challenge” – essentially the question of what happens if computers take over completely, and if not, what happens at the hands of an elite who don’t need the masses for labor, or anything else. Will people be simply exterminated? Will the population be gradually but sharply reduced through population control, eugenics, family planning and propaganda (as is actually happening now), or will the masses instead be treated as “pets” with cute hobbies and trivial pursuits, but no real meaning in society? The question remains, or could be a combination of all of the above. In the face of mass unemployment and depopulation, is violent revolution justified? For reasons I explain in the video above, likely not. It is not clear who could be stopped with force that would in turn result in stopping, or slowing, the tyranny; the tyranny exists, but it is systematic and compartmentalized in the hands of thousands, and probably millions of people. There are countless corrupt and even evil officials, but stopping them will not stop the system. Moreover, violence has become a trivial event for media sensationalism and a tool in justifying greater police state powers, etc. Thus, violence is the wrong approach on many levels, including moral. Gandhi made significant advances with non-violent non-cooperation, by the way – yet was ironically inspired by the same works of Henry David Thoreau on civil disobedience and self sufficient living that inspired the violent revolutionary Kaczynski. Meanwhile, there is the question of liberty, and the kind of freedom that America’s Founding Fathers pursued circa 1776. Years later, in his letters to John Adams , the second president and a one-time political enemy of Jefferson’s, Jefferson posed the idea that freedom could not so easily restored through violence, particularly if the public were unenlightened and uneducated in the ways of liberty and good self government. Jefferson discusses the case of ancient Rome , where the usurped powers of Julius Caesar transformed the republic into a thoroughly corrupt dictatorship. Caesar was killed in a conspiracy by the Senate, led by Brutus . Ultimately, the Caesar dynasty remained in control of the empire anyway. “These are the inculcations necessary to render the people a sure basis for the structure of order and good government. But this would have been an operation of a generation or two at least, within which period would have succeeded many Neros and Commoduses, who would have quashed the whole process. I confess, then, I can neither see what Cicero, Cato and Brutus, united and uncontrolled could have devised to lead their people into good government, nor how this enigma can be solved.” –Thomas Jefferson to John Adams, Dec. 10, 1819. The take away here is the need for education – not just training, or common core standards to produce automatons and robot-like worker bees, but real education based upon enlightening and empowering information. If the future needs anything it is thinkers, not regurgitators, memorizers, replicators and drones – technology is undoubtedly already quite good at all that. The Founders were great scholars of history and political theory and instituted limited government after careful consideration of all the things that went wrong with past systems, and what the best options were for encouraging freedom on several levels. They weren’t perfect, and in fact were quite flawed as individuals, but they did make a principled attempt. Today, in the age of technology, computers and the Internet, freedom is losing to the control freaks, engaged in mass surveillance, mind control, economic centralization and oligarchical collectivism. Is there room for freedom in this technological society? Could a peaceful revolution succeed? That depends upon what we can learn from technology’s inspiring possibilities – but also what we can learn from the many lessons of the past. Hint: most of these lessons are being wholesale ignored, as power for the state and corporate institutions concentrates and grows to levels well beyond dangerous, looming and eerie. Authorities in France on Thursday announced the launch of an investigation into a series of mysterious drones that have been sighted flying over a number of the nation’s nuclear power facilities. Unmanned aircraft have been documented flying over seven separate facilities operated by the state-owned nuclear power company EDF between Oct. 5 and Oct. 20, according to company officials.